The search function aren't that super here euuuuu. Why is the RF injected into the side of the EM Device. I know it's a basic question but can someone expand on it a little more? The technique will come into its own when alignment over at least one million Km is feasible. Now you'll notice that they were in a clean room (albeit in air) so that should give pause to anyone considering using this as a launch system for extremely light payloads directly from Earth's surface. Nevertheless, a little noodling would not go amiss on this topic. The available motive power is Q*P (Q=200, P=800 W in the video), so the force F = 2*Q*P/c (1.1 mN in the video), so the acceleration a = F/m (m=0.45 Kg, a = 2.5 mm/s2 in the video). What would it take to get up to 1 gee for an Earth-based launch? The acceleration needs to be increased by a factor of ~4000x. Leaving m alone for the moment, Bae states that Q could improve by a factor ~5x (200->1000). Now we need 4000/5 = 800x improvement. Using a 800 kW laser does that for us (1000x). Alternatively we can use a lower mass and thus a lower power laser. No one else has chimed in, so I'll give this a shot. I believe the choice of antenna position is predominantly a function of the antenna beam pattern, and the desire to couple maximum energy into the cavity. A simple dipole antenna radiates/couples well in the perpendicular direction, so placing a dipole antenna perpendicular to the cavity wall would allow direct coupling into the dominant resonant direction (i.e. between the concave/convex end plates). I had proposed (many pages back) that the use of a waveguide to inject a magnetron's signal had the effect of a directional beam pattern that was much better at injecting energy than removing energy from the cavity. (since resonanting energy is dominantly between the end plates, a waveguide input roughly perpendicular to the walls would inject energy better than remove energy) However, I'll readily admit my reasoning may be overly simplistic. Using the enhanced photo I built a Google SketchUp model such that when overlayed with the image it matches. Then I scaled the model so that the RF connector plate measured 1 inch along one side. 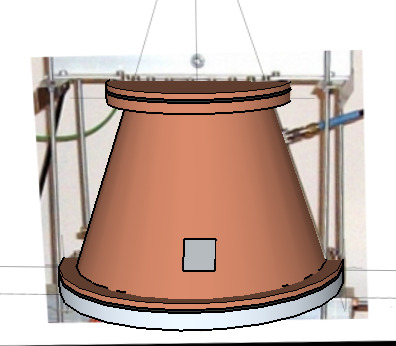 The resulting cone has dimensions of sD: 122.2mm, bD: 223.8mm, L: 153.98mm. Not sure the margin of error but the numbers should look fairly close I hope. 1- Could someone please try an em cavity with the bottom (large curved end) not electrically bonded to the sidewalls & top. ie place a circular insulating gasket between the contact point of the sidewall bottom edge and the actual bottom curved plate, just the wall/plate boundary NOT covering the internal surface area of the curved plate. What do you think will be different if the bottom plate is electrically insulated? I think we could easily incorporate this into our design, we have planned to leave a small clearance between the bottom movable plate and the frustum. Our bottom plate may not be as curved as Shawyer's, but we'll be able to provide a small amount of curvature by tighting the screws to different lengths. Accurate to about 5% = 1-cos(18o). Could be better were you to use my observation about the distortion in the 1" dimensions. I have this, but don't know what the small end chord, large end chord, or the perpendicular distance between the chords should be, in terms of wavelengths. Or the drive frequency for that matter. What is your antenna like. A centered dipole (vertical in the images) works well, and the longer the better it seems to me. It's an actual 3D Model and the projection lines up to a pixel, so the 'distortion' should be accounted for. After building the 3D-Model I'm 'fairly certain' there is a rubber gasket between the end plates and cone. It's 1/16 of an inch thick in the model which reflects what I see in the image. A little more detail - hidden edges can be seen in the xray rendering. It was first question in my mind also. Why not on top or bottom ? r1 to ((r2-r1)/h) z' + r1 ? It's Eq. 18 that still bothers me a bit. Invoking the Heaviside step function is OK, but I don't see the addl. components being detectable outside the cavity w/o a non-linear term. Maybe I'm missing something ? Beats me. And it looks like the placement would put part of the big end in the near near field and loading the bejesus out of the source. I've also noted they use a simple loop antenna, but there seems to be no consideration to what we called at Collins the "look angle"
Basically, you have to use a defined google search to find past items of interest on this thread.